Horslyx are thrilled to announce that after the success of last year’s Ambassadors all six representatives will be staying on as part of the Horslyx team for 2018.
and Rowan Crosby will continue to promote the brand throughout the upcoming season as Ambassadors, although Horslyx will still be reviewing applications as and when throughout the year, keeping an eye open for any future stars. 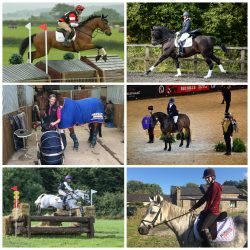 2017 saw some fantastic results from the rider team which included wins at HOYS, Royal International and Royal Windsor, as well as team members competing for Team GB in a variety of disciplines and achieving their own competition goals. Ambassador Bonnie Fishburn also welcomed a new member to her family with the birth of Harriet Rose Hollins. With new and old partnerships currently being worked on through the winter our riders are getting set for an exciting 2018 and we look forward to sharing their results with you.